Are you someone who appreciates and wants to show others the beauty and tranquility of this amazing, relaxing piece of heaven? Do you love the sound of a stream from any open window in the house? Come stay in our quiet, clean getaway! We LOVE it and know you (and your children or grandchildren) will too. It is a 1200 square feet retreat, and has been detailed to make your stay comfortable and memorable. The house itself has two bedrooms, one bathroom, and a living room with two futons -- all totaling two queen sized beds, two full sized beds, and two twin beds. The kitchen is fully equipped for any meal, fresh ground coffee, an apres ski treat, or family barbeque. The kitchen table sits six, with room for three more at the breakfast bar. The house sits on more than an acre, which lends itself to short or long walks, enjoying the stream (which runs year round, and is just yards from the house), smelling the fresh mountain air, sitting outside and reading a book -- or doing some artwork! The nearby town of Salida boasts many activities: art galleries galore, indoor hot springs pool, bowling, hatchery, lakes, biking, hiking, fly fishing, white water rafting, winery, live theatre, dining, pubs, summer and holiday events, horseback riding, go-kart riding, snowshoeing, snowmobiling . . . . Do all of that -- and then -- come back to our hideaway and watch wildlife, have a glass of wine by the stream, play horseshoes or badmitten, read a book, take some pictures, see a movie, cook a feast, listen to music, and sleep to the sound of the Cherry Creek right outside your window. We have books, movies, satellite TV, DVD and VCR capacity. This is a year-round playground! Summer hikes, winter moonlight snowshoeing (snowshoes provided for three), mushroom hunts, and fall color photography. There is never a bad time to visit. For parents and grandparents: Know that there are books, toys and games, a pack-n-play with crib sheets, bathroom step stool, and booster seat for a little one! Please feel free to ask for more photos or details! My cabin is on facebook too! Check out Kriss Cabin Vacation Rental Home for more pictures and information. I live in the Denver area, and love bringing my two children up to the cabin for weekend getaways. We use the cabin whenever we get a chance, but we also enjoy sharing it with other families! The entire area offers an unlimited number of activities for couples, families, and individuals. The views, the fresh air, the mountain smells, the rushing stream... how can you even narrow down the best part? As a family, we have had a number of unforgettable experiences -- from the white water rafting and ziplining to quiet family movie nights and night hikes. This area is hands down our favorite place to be... we plan our trips to the cabin as frequently as our schedule will allow... and we always have a difficult time leaving. One of the best things about this cabin is the water! The stream and the sound of running water is truly relaxing. The house is clean, comfortable, and perfectly located for the many activities the Salida area has to offer. It is perfect for a family, an adventurer, an artist, or a reader. Salida is a slice of heaven, and we know anyone who spends any time there would agree! One of the twin sisters peeks through the 80+ foot ponderosa pine and aspen trees. Stream runs year round just yards from the house. Its soothing sound has people coming back again and again. A stackable washer/dryer is in the cabin. Well equipped. You can make just about about anything in this kitchen! The large, stream side deck has a full sized gas grill and table and chairs for outside dining or for playing games. This large, covered deck is a fun place to relax and listen to the stream. Access to Rainbow Trail, hiking, biking, fishing, hatchery, rafting, snowmobiling, cross country and downhill skiing, art galleries, horseshoes, badmitten, fresh air, running stream through the property, clean, comfortable accommodations! Please note, due to the density of the forest around the house, and the likely fire ban in the county, there are absolutely no outdoor fires allowed of any kind. Once you get there, you will completely understand! My husband and I went here for our 30th wedding anniversary! The photos shown here are beautiful, but the property is much much more beautiful in person! It's great having the river right outside your back door! The cabin was fully equipped with everything we needed! The owner is just the sweetest little thing and such a hoot! We're hoping to go back soon, but bring the whole family next time! I would highly recommend her property! Loved this place but it was a bit too far off the beaten path for a vacation rental. Owner was very nice and accessible for all my questions. We loved the little bear that came to visit every day. The cabin was very spacious and totally loaded! My friend of 40 plus years flew in from RI to spend 5 nights with me at this amazing cabin. We both loved it. 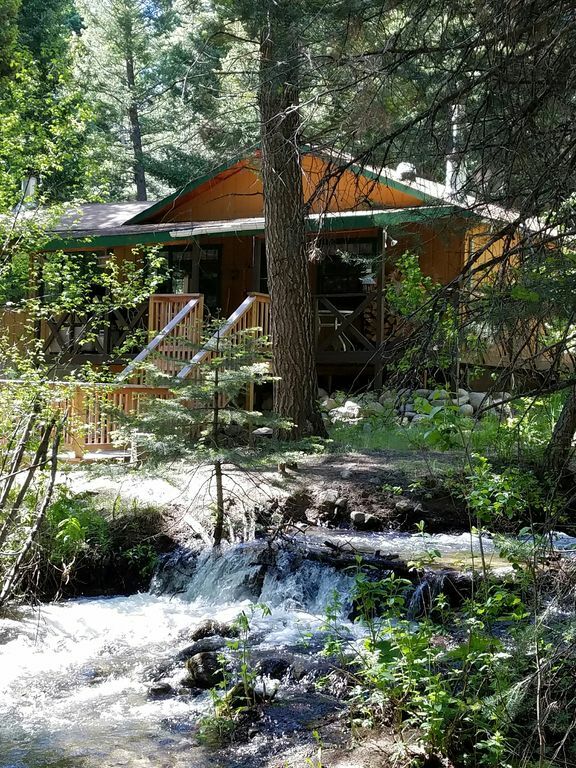 Comfortable, clean with an amazing creek and calming nature setting. The living room has windows on three sides for nature viewing, so beautiful to sit and read or have deep conversations. Had fun fishing, hiking and visting Salida. Kitchen is well stocked and we cooked all are meals with ease. We did not want to leave. Two of us came for a couple of days at the end of a long road trip, just to write and get offline. We relaxed, sipped evening wine on the porch, cooked and ate in, watched some DVDs we'd brought, read books and wrote all day. Can't comment on nearby hikes or other activities, but those were covered by other reviewers. I slept like a log, the bed was so comfortable and the woods so quiet. We wanted to get away to enjoy the wilderness and snow. We were pleasantly surprised with a wonderful location and an outstanding host. She called after booking to confirm and give us the run down. Suggestions and her contact. WE WILL RETURN!! Perfect for our group of 7. The cabin was cute and had everything we needed. We'd love to come back and visit this summer. Access to the Rainbow Trail! !